Our most recent follow-up questionnaire Survey 2017 is now closed. 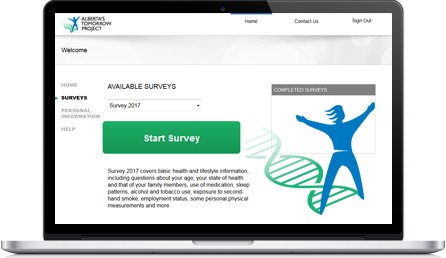 Survey 2017 made Alberta’s Tomorrow Project history, as it was the first time an online version was offered. Tens of thousands of participants agreed to go digital, saving our project valuable resources in reduced printing, mailing, and manual processing costs. Strong fiscal management ensures the long-term sustainability of this valuable project. Your privacy and confidentiality remain a top priority at Alberta’s Tomorrow Project. We partnered with the Government of Alberta to create a secure and private online registration process. Remember, your ongoing involvement in Alberta’s largest health research study is crucial to ensure that the huge database continues to grow and support cancer and chronic disease research. In the weeks and months ahead, we will be contacting participants periodically to confirm certain survey details. In addition, we have plans to roll out a diet and physical activity questionnaire, in the next 2-3 years. As always, we thank you for your continuing support of Alberta’s Tomorrow Project.